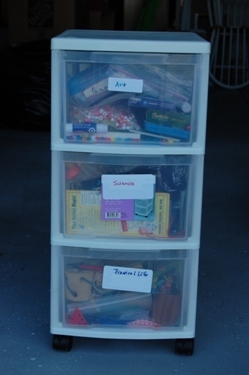 One of my favorite topics related to Montessori is how to go about organizing all the wonderful materials. Being “hands-on” means lots of stuff, and that means finding a place to put all of it. One thing I’ve used successfully for many years is wheeled carts. These usually have three drawers, and can be found all over (from Target to the Container Store). I currently have three of them, one drawer per curricular area: Art, Science, and Practical Life; History, Geography, and Geometry; and Biology, Language, and Math. I’m going to be posting soon on where/how I store my card materials, charts, and wooden materials but for now let’s take a look at all the objects and tools needed for learning in a Montessori classroom. Please note: for a detailed look at the contents of each drawer, please see the “Using Carts for Organization” photo album at my Montessori for Everyone Facebook page. 1. What do you put in your carts? I used to try and keep everything in them – including card materials (like matching cards and nomenclature cards) but that was too much. I have a different place I keep card materials now, so I like to keep my carts for supplies, objects, and other things that take up space. Some examples are: rocks and minerals (Geography), object bags for Pink, Blue, and Green Series (Language), buttons and sewing tools (Practical Life), geometric solids (Geometry), and flashcards (Math). 2. Are the carts used by the children? No, they are only for me. I either take materials out of the carts and put them on the shelves for long term use, or just take out what we need for a short time (like art supplies for a specific project or equipment for science experiments). 3. Where do you keep your carts? When I was teaching at a school, I was lucky enough to have a large closet in my classroom and kept them there. At my last house, I had one in each of three closets (not handy!). At this house, I’ll be able to have all three together near our homeschool area which is very nice. Enough chatting; head over to my Facebook page and take a look at the carts and their contents!